The Trump administration is proposing to roll back another Obama-era energy regulation, this time one that aimed to curb methane leaks from oil and gas operations on tribal and public lands. Methane is a powerful greenhouse gas, even more potent than carbon dioxide in the short term, that contributes to climate change. 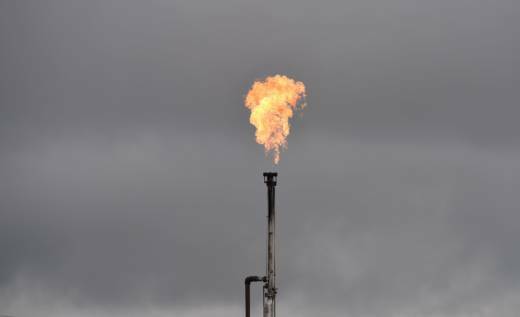 The Obama administration said that large amounts of methane are lost into the atmosphere through through leaks, as well as intentional venting and flaring at energy production sites. It moved to limit that by requiring oil and gas companies to capture leaking and vented methane at existing sites, to gradually update their technology and to make plans for monitoring escaping gas. The Government Accountability Office says as much as $23 million of potential royalty revenue from those gases is lost annually. But in a statement, the Department of the Interior said that rule was "unnecessarily burdensome on the private sector." "The flawed 2016 rule was a radical assertion of legal authority that stood in stark contrast to the longstanding understanding of Interior's own lawyers," said Deputy Secretary David Bernhardt. The Trump administration revised the rule after Congress failed to repeal it outright last year. The proposal will be open to public comment for 60 days. The move comes a week after the Environmental Protection Agency eased its own protections on methane emissions. That proposal was aimed more at new oil and gas sites and would cut required inspections for leaks from every six months to once a year. The American Petroleum Institute welcomed the latest rollback, noting in a statement that "methane emissions have plummeted 14 percent since 1990" even as natural gas production has greatly expanded. Oil and gas producers say they already have an economic incentive to capture methane, because they can sell it. Several large oil and gas companies have also announced new efforts to limit the release of methane, to help rein in their carbon emissions. Environmental groups criticized the Trump administration rollback. "More methane waste will harm our air and water and have significant public health impacts," said Jamie Williams, president of The Wilderness Society, in a statement. A group of state attorneys general also threatened a legal challenge, calling Interior's proposal "a shocking abdication of the Secretary's fundamental fiscal and environmental stewardship responsibilities over our public lands." The methane proposal is the latest in a series of moves meant to undercut President Obama's signature moves to address climate change. This year President Trump has also announced proposals to ease carbon emissions limits for power plants, and fuel economy standards for cars and trucks.